Q: How do I use iGolf Value Guide to get cash for my golf clubs? 3a. Coachella Valley CA customers, complete our checkout form, receive an email confirmation, and we'll call to schedule a pickup and payment. 3b. Customers elsewhere ship clubs to us at customers expense. Note: Club(s) totalling $100 or more qualify for FREE shipping, prepaid shipping label will be sent via email once you have completed our checkout form. Once the golf equipment is received and inspected, the money will be deposited in your PayPal account within three (3) business days, please allow seven (7) business days for payment by check. Q: How does iGolf Value Guide determine the value of a golf club? iGolf Value Guide has their own database of prices that is generated from a balance of the fair market value of the product and our competitors' pricing. eBay provides completed auction price data that iGolf Value Guide analyzes. This data provides a unique window into the fair value of secondary golf club market. 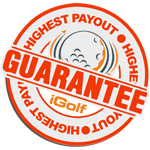 In addition, iGolf Value Guide is constantly researching competitors' pricing and guarantees the highest cash payout in the industry. Q: How to search and determine the value of a golf club? a. Search Box "What type of clubs would you like to sell?" type manufacturer name, model name, and club type. Note: flex, loft, and RH/LH does not apply to search. b. Drop Down Menu "iGolf Value Guide Catalog" choose club type, manufacturer, and model. c. Product Type Image "Search by Product Type" click on product type then more advanced search functions are located on right side of page. Q: Why is my $300 Driver only worth $35.00? Q: What if my clubs are not on the list? 1-855-678-6737 or email support at CONTACT US and we’ll be happy to give you a quote. Q: Where can I find golf club shipping boxes? Your local golf pro shop usually have lots of them that they are just throwing away and would be happy give them to you. Or try visiting your local electrical supply store, flourescent light shipping boxes are perfect for golf clubs, most are 48" and 60" but you can cut to fit. Or you may visit your local USPS office (order online) and request a free Priority/Express Mail Tube (Medium) which is perfect for a putter or wedge, box is only 38" long but can be modified (doubled) to accommodate most clubs. Coachella Valley customers receive payment as soon as golf clubs are received. Customers elsewhere can expect a check in the mail within 7 business days of when we receive your shipment. Q: Do you purchase clubs from international customers? We currently do not accept golf clubs from customers outside of the United States, customs and duties make the process to difficult. Some damaged clubs have no value, others may receive partial value. For more information to go www.iGolfValueGuide.com/conditionscale . Q: What if my clubs have upgraded exotic shaft(s)? 1-855-678-6737 or email support at CONTACT US and we’ll be happy discuss. Q: What is iGolf Value Guide Highest Payout Guarantee? Our 125% Highest Payout Guarantee policy is a reflection of our confidence that we offer the HIGHEST PAYOUT in the industry, and reinforces our belief that trade-in value should never be an issue when using our Re-commerce service. If you find a higher cash payout within 7 days of processing your Instant Sale form we will MATCH the higher trade-in value PLUS an additional 25% of the difference from any authorized cash U.S. payout website. CLICK HERE for Highest Payout Guarantee Terms and Conditions. Q: What if my trade-in does not meet your criteria? Return the product at your expense, shipping is $10 for one item, add $1 for every additional product. If club has "no value" item and you agree we will dispose. We may offer a reduced trade-in value.